I'm glad I bought it for myself last year, so I will use it when adding a navi to a child's car. This review is about item#58165651. Since the goods arrive immediately, and the price is the same as the mass merchandisers, I always use it. This review is about item#34976462. H 19 years used for YZ 11 cube. Purchased by checking conformity with manufacturer's HP. However, it does not fit. Per year, we should have purchased after checking the vehicle side coupler. This review is about item#34976471. It is very convenient to use for Toyota, Suzuki, Daihatsu. 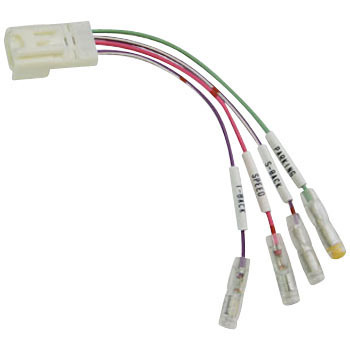 It is easy to install because there is no need to check the position of the speed sensor and back sensor. Since it can be purchased cheaply by Monotaro, it is recommended to install it cleanly using a coupler. If it was a connection with electro tap, we had to check energization with a tester, and it was resolved that I was worried that the mold removed at the time of sale remained. Even if it is compared with genuine goods, quality is good and will continue to be used as well. It is not necessary to process genuine wiring, but if you think about restoring, it is good to use with coupler on. Work is also satisfactory with crisp crackers.